Apr16 by Steven Birchfield A.M.A. Voting is taking place between 07:00 (7 a.m. – 0400GMT) and 16:00 (4 p.m. – 1300GMT) in Turkey’s eastern provinces of Adıyaman, Ağrı Artvin, Bingöl, Bitlis, Diyarbakır, Elazığ, Erzincan, Erzurum, Gaziantep, Giresun, Gümüşhane, Hakkari, Kars, Malatya, Kahramanmaraş, Mardin, Muş, Ordu, Rize, Siirt, Sivas, Trabzon, Tunceli, Şanlıurfa, Van, Bayburt, Batman, Şırnak, Ardahan, Iğdır, and Kilis. These provinces consist of 38% of the countries area but represents only 23% of the population. For the rest of the country, ballot boxes opened at 8 a.m. (0500GMT) and people would be allowed to vote until 5 p.m. (1400GMT). The reason for the time difference is that the sun rises and sets earlier in the east of the country than in the west. I therefore have cast the chart for the opening of the polls at 07:00 but will use the capital as the location. The Ascendant is 13° c 35’ (Taurus). Lady of the Ascendant is Venus (representing the people of the nation) in her exaltation Pisces in the 11th house; a very strong position being oriental and direct. An interesting note is that the Midheaven falls in the 9th (the Law) and the moveable sign of Capricorn. The proposition being voted on of course is a change in the law! The 10th whole sign is Aquarius. 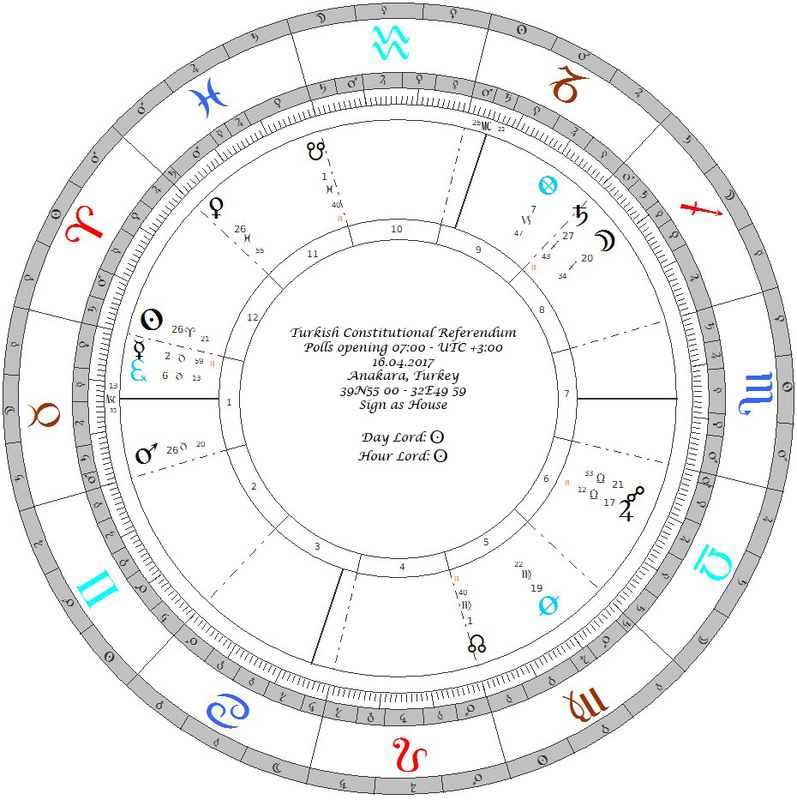 Both the 10th by counting (Aquarius) and the 10th by division (Capricorn) are the signs ruled by Saturn. However Saturn in Sagittarius falls in aversion to its domicile in Capricorn. It is therefore a poor significator for the law. I would look rather to Mars in the Ascendant which is the exalted ruler of Capricorn and also sends his aspect co-present with the degree of the Midheaven in Capricorn. Very simply in this chart, the lady of the Ascendant, Venus holds a partile aspect with Mars in her domicile, receiving him and pushing her dignity on to it. There is nothing that could have been a stronger “yes” in the chart. But there is a second testimony equally powerful. We see that the Moon (universal significator of the common people) joined to Saturn. For better or for worse, it would be difficult for me to see how this chart could not be indicating anything other than a resounding yes vote for the Constitutional amendments. One comment from Behiye Kayran in Turkey was very significant, and that is that Venus has always been the significator of Islam. And we see it strongly receiving the constitutional amendments. On the other hand I just noticed in my chart that the Moon (common people) actually joins the Sun first (the opposition). However because the Sun falls in the the weakest part of the heavens in the 12th …. and the strength of Venus is more powerful and strong than that of the Moon I would have to say it is going to pass although it is clear there is a split between two divisions of the people…. those that are secular (the Moon) and the Islamist’s (Venus).